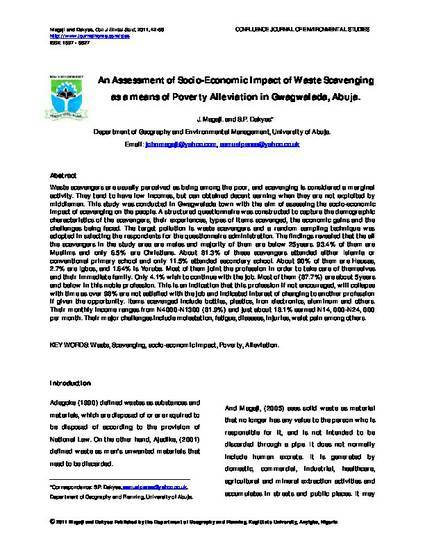 An Assessment of Socio-Economic Impact of Waste Scavenging as a means of Poverty Alleviation in Gwagwalada, Abuja. Waste scavengers are usually perceived as being among the poor, and scavenging is considered a marginal activity. They tend to have low incomes, but can obtained decent earning when they are not exploited by middlemen. This study was conducted in Gwagwalada town with the aim of assessing the socio-economic impact of scavenging on the people. A structured questionnaire was constructed to capture the demographic characteristics of the scavengers, their experiences, types of items scavenged, the economic gains and the challenges being faced. The target pollution is waste scavengers and a random sampling technique was adopted in selecting the respondents for the questionnaire administration. The findings revealed that the all the scavengers in the study area are males and majority of them are below 25years. 93.4% of them are Muslims and only 6.5% are Christians. About 81.3% of these scavengers attended either Islamia or conventional primary school and only 11.5% attended secondary school. About 90% of them are Hausas, 2.7% are Igbos, and 1.64% is Yoruba. Most of them joint the profession in order to take care of themselves and their immediate family. Only 4.1% wish to continue with the job. Most of them (87.7%) are about 5years and below in this noble profession. This is an indication that this profession if not encouraged, will collapse with time as over 98% are not satisfied with the job and indicated interest of changing to another profession if given the opportunity. Items scavenged include bottles, plastics, iron electronics, aluminum and others. Their monthly income ranges from N4000-N1300 (81.9%) and just about 18.1% earned N14, 000-N24, 000 per month. Their major challenges include molestation, fatigue, diseases, injuries, waist pain among others.